This little beauty looks like Brookwood Stone, but it's softer and has neat little black specks. What you're looking at is HALF of the world's known supply of this material that I have cut; (here is the other half, long since sold). 25.5mm x 19.5mm x 4.5mm. Weight: 16.30 carats. Every one of my cabochons is custom cut to take the best advantage of the particular slab from which it is fashioned. Colors may vary somewhat from what is pictured due to differences in computer monitors. Do you like Unknown Stone Cabochons? 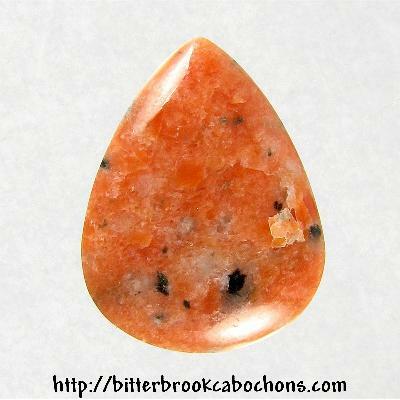 Click here to see all of the Unknown Stone Cabochons on the site! You are visitor number 85 to this page this year. The artist cannot guarantee the accuracy of the identification of these cabochons, although he makes every reasonable effort to do so. Descriptions or photos may not be used without permission.